A wonderful day to wind down and chill out. Clearwater provides one of the best beaches in this area of Florida, and there's nothing like a bit of sea air and warm sun to get you in the holiday mood! 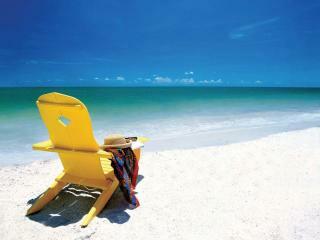 Here you will have plenty of time to relax on the beach and swim in the beautiful warm waters of the Gulf of Mexico. Lunch in a lunch at a local beachfront restaurant with great ocean views is included in the ticket price. The varied menu includes sandwiches with fries and coleslaw; Greek, Caesar, Chicken or Tuna salad; Pasta; Pizza; Fish & Chips. The kids menu includes Burgers, Hot Dogs, Chicken Fingers or Fish & Chips. In the afternoon, you can relax on the beach. Your coach takes you back to Orlando late afternoon/early evening.